You run a great website. 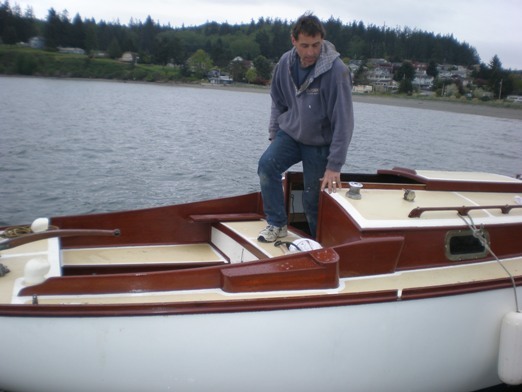 I have Compass Rose, a fiberglass texan Shaw 24, up in Port Townsend Wa. She's a great sailor -- I've put in many sailing miles in the last two since I purchased her. I see that the Shaw 24 in New Orleans has sold (Centaurus), and also a month or so ago, that some guy is working on another Shaw 24 here in the Seattle area. I'm hoping to maybe get in touch with those people and do some talking yawl. Incidentally -- yes, the mizzen mast is a great tool to have available -- especially jib and jigger on a windy reach. Pending a picture of Compass Rose in Aron's care we'll post a file photo here. We were advised, by prior owners Robin Farrand and John Rogers back on April 19, 2011, that Compass Rose had been sold to Aron. Aron 'unofficially' checked in with Dyke Williams (Trina) on May 12, 2012 with the following email - which Dyke forwarded. I noticed your e-mail address on the Dolphin site and thought I'd like to contact you. 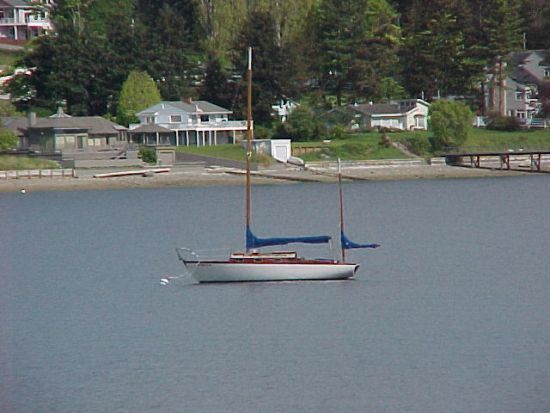 I have one of the fiberglass Shaw 24's, Compass Rose. She's in need of quite a bit of work to make bristol but is a fine sailor. I was curious if you might have some pictures of how your boat is rigged. My boat came to me with all fittings removed, so I sort of winged it, putting the boat back together and somehow think things could be improved. I'd love to really look over your boat to compare it with my Texan counterfeit. From what I've seen my boat seems to be a faithful copy but really only a side to side comparison, a tape measure and a scale would tell for sure. If it's easy enough to forward some e-pics I'd really appreciate seeing them, if not, no problem. Dyke's reply is below. Since then, coincidently, we set up a new page of Trina photos on file at the Mystic Seaport collection. Click here to see them. Almost all glass boats are Dolphins, not Shaw 24's. Expert here is Ron Breault - see his outstanding website at www.dolphin24.org. No pics of Trina left. Measurements from her would not help on a glass boat - they're different, and Trina is 1,000 miles away. See what you can learn from Ron's website. Thanks so much for your help and the website's support in selling her- we had some great contacts that were directly through Dolphin24.org, and all of our Craigslist contacts really liked and were interested by the information on your web site. I'll still be checking in at the site - I'm always interested to see what Dolphin owners are up to now. March 26, 2011. Robin is selling Compass Rose. Click the link below for the updated Seattle Craigslist ad, more pictures, and contact information. Below the ad are some pictures and info regarding Compass Rose. For more information about the Shaw 24 click here. 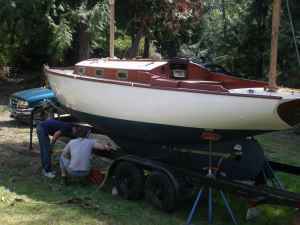 Beautiful, classic Bill Shaw design, custom built in 1966 - fiberglass hull, wood everything else. 10 HP Yanmar Diesel runs like a top. 9 sails, alcohol stove, ice box, sink, Dickinson solid fuel stove, anchors, bilge pump, compass, Porta-potti. This is an elegant little yacht that always turns heads, and is usually "the prettiest boat in the marina." She is currently a project, but the pictures in Langley Marina were taken only 3 years ago, and the two lower pictures were taken in March 2011. She was a camper-like live-aboard for our daughter in Port Townsend, for a year. We have a beautiful boat that we’ve owned for about 12 years. 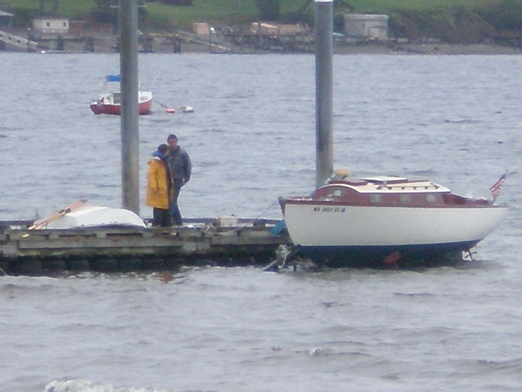 We were told when we bought her that Compass Rose is a Shaw 24, built in 1966, and have since read up on Bill Shaw, S&S, and Dolphins (we have the “Good Old Boat” article, which was a lot of fun to get when it came out- as you can see from the pics, Compass Rose is a yawl, so we felt there was a great resemblance to Trina- plus, we lived at one time in Milford CT!)). Recently we came across your great web site- what a lot of helpful and very interesting information- thanks so much for putting it together. And Marionette is gorgeous! Unfortunately, we had a fire aboard Compass Rose in 2004 and there was a lot of smoke damage (and some charring, although not structural). 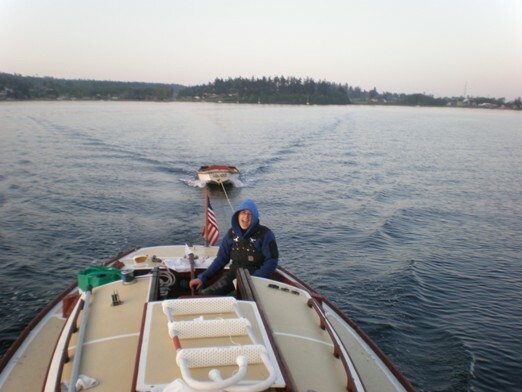 Our daughter, who just graduated last September from the Northwest School of Wooden Boatbuilding, is renovating Compass Rose and plans to live aboard her in Port Townsend, WA. 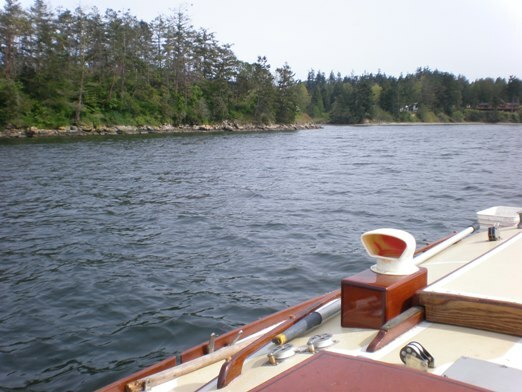 We bought a Blue Water Boats Ingrid 38’ (William Atkin design in fiberglass) in 2005 and she’s currently our “main boat”, along with sundry dinghies and kayaks. 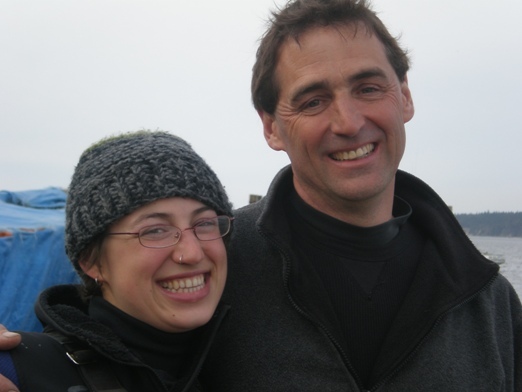 I’m attaching some pictures of Compass Rose – let us know what you think re: her really being a Shaw 24. 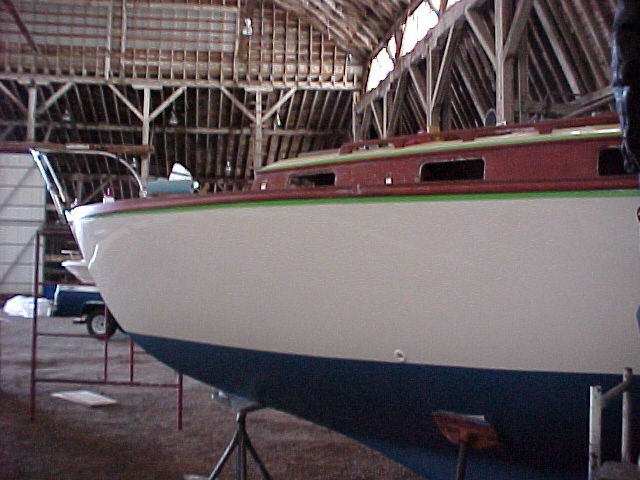 The hull is fiberglass and everything else is wood. We think her background includes some time in Texas, but we don’t know much about her history- any advice about how to find out more would be appreciated. 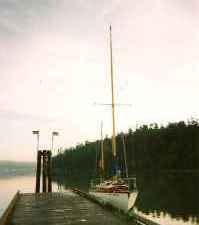 We bought her on Whidbey Island in Washington State, where we live and sail, and don’t know where the former owner now lives. We’d love to be members, if that’s possible for your organization-? Didn’t see a “how to join up” part of the web site. ps I wanted you to know that John found “Marionette’s Trailer” to be helpful in getting our own trailer ready. Yesterday he and our friend Scott cut down and welded the jack stands onto the trailer for a permanent solution for transporting Compass Rose…. 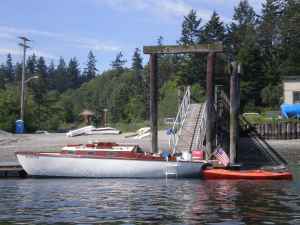 Webmaster Note: If you have or had one of our boats you are "a member". If you like our boats you are "a member". If you send in stories and pictures about our boats you have "joined"! 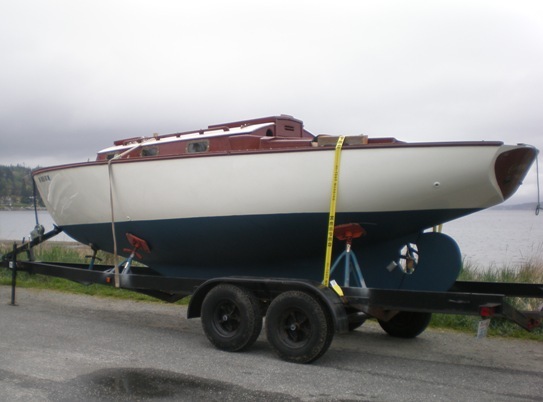 On May 5th Robin advised that Compass Rose was launched after her post fire restoration project and she sent in the following email (edited) and photos. 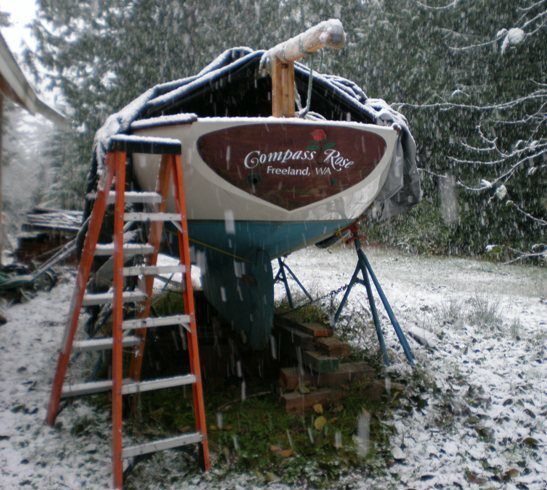 A lot of work has been done on Compass Rose, our Shaw 24, since she had a fire below in 2004. We launched her the first weekend in May 2008 …. All went really well - including crossing the Strait of Juan de Fuca on a beautiful, calm day. 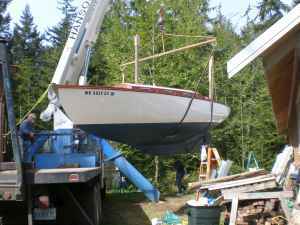 Now she’s safely anchored near Port Townsend, Washington where Leah has her boat refinishing business. Next step will be rigging her, but it’s time for a break! Note the high bridge deck - and those winch pads. Who does the varnish work?